The compact HYDRIM L-100W and G4 Washers consistently deliver the highest quality fully automated washing. Pre-programmed Cycles deliver accurate times and temperatures. HYDRIM Washers clean faster, cut cleaning costs, and deliver residue free surgical instruments and utensils. For Dental Surgical Instrument Washer specifications, go to HYDRIM Surgical Instrument Washers. 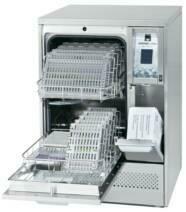 Surgical Instrument Washer Disinfectors cut washing costs. Countertop Washer Disinfectors save space. HYDRIM Surgical Instrument Washer Disinfectors clean faster.